Many of us would love to treat our skin to traditional facials thinking that is the best way to keep a youthful appearance. While these kinds of facials help skin they do not offer drastic results and they can be time consuming and costly. For the price of about three facials and a fraction of the time, a medical grade chemical peel like the Perfect Derma Peel is the way to go. 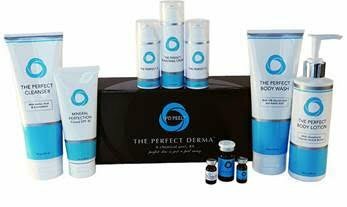 I chose the Perfect Derma Peel for several reasons. It is the only medical grade chemical peel with Glutathione, a powerful antioxidant proven to have anti-aging and skin lightening benefits. I have very sensitive skin and this peel works for all skin types and ethnicities. Unfortunately I have had negative reactions to peels in the past so I was a little hesitant at first. I visited with Theresa Pinson a nurse practitioner and master spa technician from Virtual Skin Spa who is qualified to apply the peel. She put me at ease right away and answered all my questions and concerns. She reiterated as well that there are no other peels on the market that do what the Perfect Derma Peel does. I was provided with post treatment towelettes, moisturizer and sunscreen to use during the peeling process which took about 6 days. The instructions were very clear and easy to follow. The first day of the peel my skin was slightly red but I was comfortable, no irritation and just a little tingling. By the end of the second day my skin started to feel tight and the peeling began. I peeled for 4 days and I will tell you plan on staying home, I looked like a lizard! Various parts of my face took turns peeling and my skin was continually sloughing off. In the end my skin actually glowed! My skin felt smoother and appeared more even. My sun spots were lighter as well. I completed my peel almost two weeks ago and my skin still has that glow and great texture. I was so happy I am contemplating a repeat treatment to lighten my sun spots further.